150 days ahead of Rio it's now official: I have a ticket to represent Austria at the Olympic Games. After our team unfortunately just missed qualifying at the EC in Aachen/GER by just 1.2 points, I stand in the Olympic qualification group B right up front with 1056 points. It was a hard race in a strong group. Everyone of them rode as if their life depended on it. The Portuguese rider Goncalo Carvalho had to chance for the two top places and the exceptional Italian rider, Valentina Truppa, was pushed back from second to third place at the last possible show with a qualifier the beginning of March by the Belgian rider, Fanny Verliefden (1037 points). But Valentina Truppa qualifed afterall just like the Swiss rider, Marcela Krinke Susmelj with Smeyers Molberg (also group B) ahead of the remaining six places in the FEI World Ranking. I am so happy - and after Athens/GRE, Hong Kong/HRK and London/GBR, I am now looking forward to my fourth Olympic Games in a row. In 2004 and 2008 I rode Falcao OLD, in 2012 it was Augustin OLD, with whom I took 13th place in the Freestyle Final, and in 2016 it will be Blind Date. 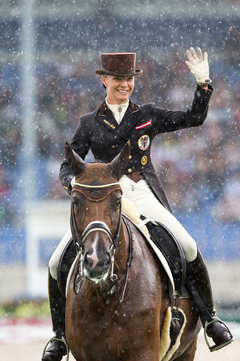 Last year's EC Grand Prix in Aachen, where Blind Date received 75.20 percent and finished tenth for his outstanding performance, was also her championship debut. But the road to Rio is still a very long one. Now we will concentrate entirely on preparing ourselves as best as possible for this mega event.